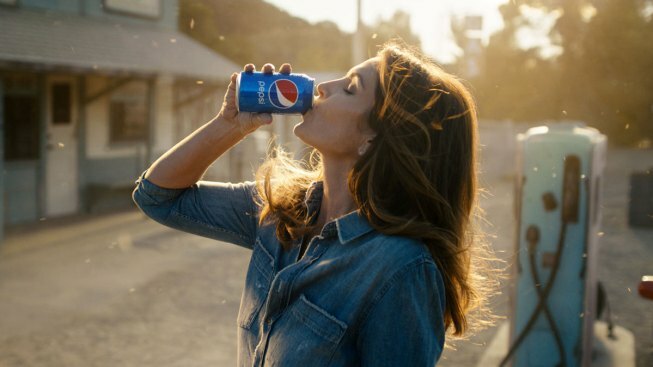 This photo released by Pepsi shows actress-model Cindy Crawford in a scene from her 2018 Pepsi commercial which will premiere during Super Bowl LII on Feb. 4. The new ad includes her son, Presley Walker Gerber, as well as footage from Michael Jackson’s memorable Pepsi commercial. Cindy Crawford is heading back to the Super Bowl: The model has recreated her iconic 1992 Super Bowl ad for Pepsi, now featuring her 18-year-old son. Crawford recently filmed the commercial, which will debut at Super Bowl 52 on Feb. 4. It includes her son, Presley Walker Gerber, as well as footage from Michael Jackson's memorable Pepsi commercial. The 51-year-old said she didn't hesitate to recreate the ad 26 years later, especially since she was able to work with her son. "Just as a mother, we drove to work together that day and we shared the same trailer. And when he was doing his thing, I was just a proud mom watching from the sidelines, trying not to annoy him," she said in a phone interview Wednesday. The new Super Bowl ad, dubbed "This Is The Pepsi," is part of the company's "Pepsi Generation" campaign honoring the brand's 120-year history in pop culture. The original features Crawford in a tank top and jean shorts — made from her own jeans she brought to the set that day — driving a Lamborghini and stopping at a gas station to buy a can of soda. She said she felt the 1992 spot "became such a classic for so many reasons." "It was one of those moments in my career that when I walked down the street, people were like, 'Pepsi!' Or I'd be at a bar and people would send me over a Pepsi," she said, laughing. "And it's funny because during Halloween a lot of women will dress up as me in that commercial. It's like an easy Halloween costume." Crawford plans to attend the Super Bowl in Minneapolis, where her father lives. "I think probably that will be the highlight for me is just getting to see my dad," she said. "I took him to a Super Bowl before I had kids ... and it's not like he ever wanted to go to an awards show or something like that, but if I can take him to the Super Bowl, that's a pretty cool thing for me to be able to do with my dad." Crawford's modeling talents have not only extended to her son — her 16-year-old daughter graces the February cover of Vogue Paris. "She's more ready for it. She's just so much more sophisticated and worldly than I was at that age," she said of Kaia Jordan Gerber. "I do know the business ... (and) I feel like who better to help guide my kids?" she added. "It kind of happened for both of them and they listen to my advice when it comes to this. The one thing they can't say is, 'Mom, you don't get it.'"